Yoga month: good for running, CrossFit & your abs! It’s that time again when another challenge month has come to an end and it’s on to the next. February was yoga month where Dane and I did at least 10 minutes of yoga every day. We decided on ten minutes because it seemed like a manageable amount of time to fit in to our day and could easily be done in the morning, before bed or as a way to stretch after training. We usually ended up doing more though and I downloaded two yoga apps and went on YouTube for tutorials. After a week or so though I had learnt enough combinations to create my own routine. Check out Dane’s website – All Things Movement – where he will soon be posting a 20 minute yoga routine guaranteed to get that blood pumping and those muscles working. As a runner I have inevitably tight hips, tight hamstrings and poor shoulder mobility from the repetitive motion of pounding the pavements but after 28 days of yoga I saw noticeable differences. – Positions such as classic downward dog helped me to improve the flexibility of my hamstrings and over the course of the month simple moves such as forward bends became easier and I could gradually go forward that little bit more. I do think it’s important to say that without pushing myself during some sessions I might not have improved as much and yes it is painful but like any other training the pain is worth it. – My general mobility and range of motion improved. I noticed that my squat depth improved as I had been struggling with this after the marathon due to majorly tight hip flexors. Not only that but the range of motion in my shoulders improved too which I am thrilled about as it’s something I really need to work on. Again, I’m not going to lie this was painful at times and I had to push myself. 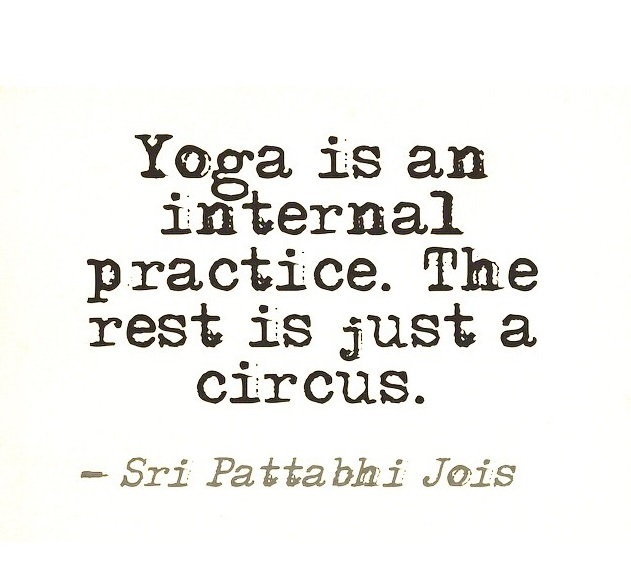 – Yoga isn’t painful all the time though! It gave me new ways to stretch after running, a way to relax before bed and a better way to start the day with that wonderful yoga feeling. If you’re a CrossFitter, yoga can help to counter some of that soreness after a tough metcon WOD as well. I also slept better which, although I can’t be sure, I believe was helped by yoga. – Holding a pose or stretch and feeling that “burn” makes it easier to push through the pain of a long run – obviously don’t push through if you’re injured – but it can help you to focus and work through it when you’re struggling. It takes your mind (and body) to a place where you can access that endurance when you need it most during a race or training run. – Practicing yoga helped me to breathe more efficiently when exercising and is something I think is particularly beneficial to runners. It can help with efficiency and eventually your breathing will naturally match your pace. – I became more aware of where my body was/where I was placing my weight. My balance improved and I was aware of how I needed to adjust the weight to improve my balance and performance. This not only helped with my running but also in CrossFit with elements such as engaging my shoulders when doing an overhead squat and squatting in general thinking about which part of my foot I was putting my weight on. – Yoga helps to improve strength and most definitely your core strength as you have to stay tight during each pose. I definitely think that to keep seeing these benefits I need to keep some yoga in my training routine. I won’t do it every day but I will try and aim for one or two 30 minute sessions a week – I really enjoyed it! 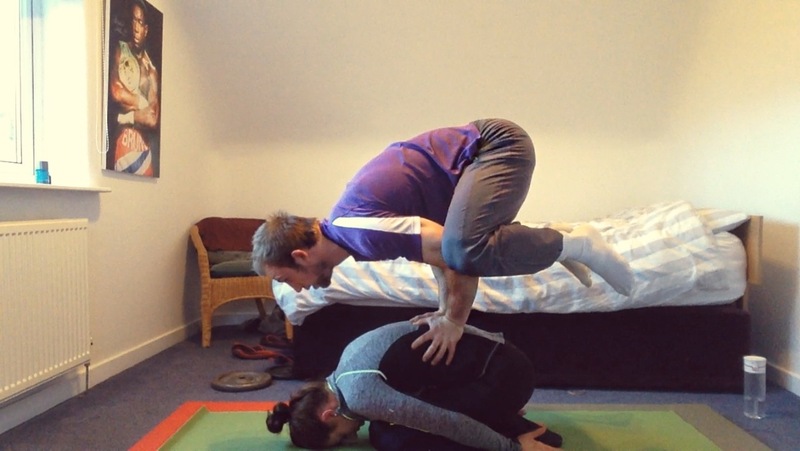 Dane and I decided to round off yoga month with some acroyoga and I’m still laughing at our attempts! My abs certainly got a good workout from all the laughing as well! We did manage to nail a few poses though and it was so much fun! I definitely think that the 28 days of yoga prior to that helped with my strength, mobility and flexibility. On the second one watch how quickly Dane manages to get his legs in to that lotus position!! March is handstand month – follow @hbryan91 on Instagram and @hannahbryan91 on Twitter to see what we’re doing. I’ll post a piece soon on the handstand progressions I’ll be doing!